Kanya Kumari, the Land's end, is the southern most tip of India. The Bay of Bengal meets the Indian Ocean and the Arabian Sea here. It is said that during the full moon in April one can see the Sunset and Moonrise simultaneously from here. 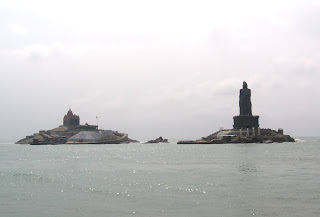 Vivekanada Rock Memorial - It is situated on a rocky island around 200 metres from the shore. Regular ferry services carry the passsengers to and back from the island. The Vivekananda Rock measures approx 534’ x 426’ at the water level and has a spacious level top at an altitude of 55 feet. The total area is about 4 acres (16,200 sq.m.). The Memorial consists of two main structures - the Vivekanada Mandapam and the Shripada Mandapam. 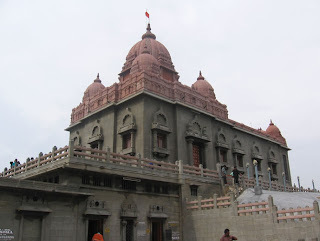 The Shripada Mandapam, Vivekananda Mandapam, and the statue have been so designed that the vision of Swami Vivekanads is seen directed towards the Shripadam. 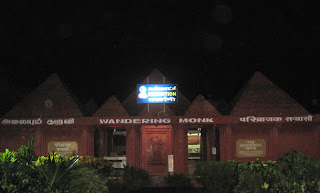 The Wandering Monk - is an exhibition made up of fibre glass visuals by Raghunath Goswami. It depicts the journey of Swami Vivekanda through India. Short descriotive narration accompanies each visual. There are some rare old Photographs on display. Entry fee is Rs 2 per person and photography is not allowed inside the Exhibition. 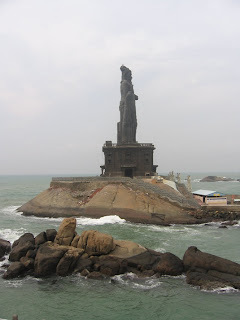 Tiruvalavur Statue - The 7000 ton statue of Tamil poet, Tiruvalavur stands tall atop a rocky island at a distance of 220 feet from the Rock Memorial. The 95 feet statue stands on a 38 feet pedestal which is surrounded by a mandapam with ten stone elephants. The height of the pedestal (38 feet) is equivalent to the number of chapters in the first part of the Tiru Kural. The height of the statue (95 feet) is equivalent to the number of chapters in the second and third parts of the Tiru Kural. Triveni Sangam - The point where the Indian Ocean, Bay of Bengal and Arabian Sea meet. It is said that a dip in the waters at this point washes away ones sins. Not sure about this, but the view is lovely from here. A vantage point to view the sunrise or sunset. Gandhi Memorial - The ashes of Mahatma Gandhi were kept here before it was immersed in the tri seas. It is said that on 2nd October the sun's rays fall at the particular spot where the urn with the ashes was kept. Kumari Amman Temple - Located near the sea shore, this temple is devoted to Goddess Kumari Devi. The idol of the Goddess has a diamond studded nose ring which is said to be visible even from the seas. 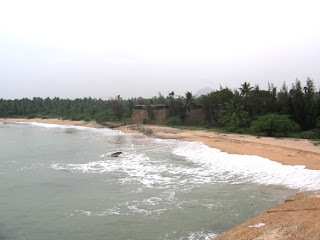 VattaKottai Fort and Beach - Vattakotai (Circular Fort) is a granite fort situated around 6 kms from Kanya Kumari. It was built under the supervision of Captain Eustachius De Lannoy during the reign of King Marthanda. A part of this fort extends into the sea. 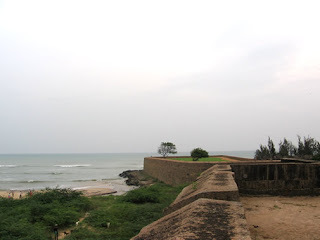 The fort offers a view of the sea on one side and the Western Ghats on the other. 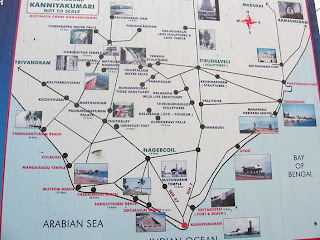 There are lot of lodging/boarding facilities in Kanyakumari suitable to all budget ranges. Since we had to board the early morning train to Trivandrum, we opted to stay in the Railway Retiring Rooms at the Railway Station. The rooms were well maintained and good. Hot water is supplied - solar water geyser is used. So, if it is a cloudy day, you will end up bathing with cold water. There is small eatery at the Railway station which opens at 4:30 am and closes at 6:00pm. They serve tea and snacks. For lunch/dinner you will have to head out of the railway station. There are numerous eateries dotting the road from the railway station to the beach. Most of the eateries serve South Indian dishes. Some claim to serve Tandoori roti, naan etc. But once you are seated in the restarurat they will tell you that Tandoori items are not being served that day. Look out for some hotels near the ticket counter to the Rock Memorial. They claim to serve Gujarati and Marvadi thalis. We did not go here, so I cannot verify if they do actually serve what they claim to.